(PhysOrg.com) -- Car batteries as we know them today may soon be relics. Storing energy in clunky containers with limited shelf lives has plagued car makers and military engineers who need lightweight, powerful and reliable means to crank engines into life, enliven radios and operate other electronic appliances. But research by post-doctoral Researcher Jiyoung Oh and Research Scientist Mikhail “Mike” Kozlov at UT Dallas’ NanoTech Institute offers tantalizing insights into a new, lightweight, reliable means of delivering power via the mighty supercapacitor. 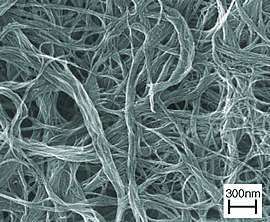 A photograph of a material obtained in their research made the cover of the journal Synthetic Metals along with the published paper, (Synthetic Metals, 158 (2008) 638). Supercapacitors are beefed-up electronic components that can be charged and counted on to store energy reliably for long periods. They deliver power in a smooth, steady stream safe for operating sensitive electronics. Unlike car lead batteries, which are typically heavier and bulker, capacitors and super-capacitors accumulate electric charge instead of delivering it via a chemical reaction. Being lightweight, reliable, safe and efficient while also offering a steady stream of power is a prized set of attributes that technology designers readily seek out. But how do they bridge the gap between current designs that call for batteries and the virtually limitless design possibilities offered when supercapacitors offer up power and the battery box disappears? That’s where Drs. Oh and Kozlov step in. The team, along with legendary nanotechnology pioneer Dr. Ray Baughman, developed a means to create supercapacitors using “paper” sheets of single-walled carbon nanotubes embedded with a special polymer called polypyrrole. Imagine if the boxy, heavy car battery morphed into something light, strong, perhaps paper-thin and flexible that could be molded to fit elsewhere in the vehicle—even hidden in plain sight. Getting rid of the weight and bulk of batteries could prove especially helpful in hybrid car designs, which today rely on a suitcase-sized array of hefty, metal batteries. And that’s just one application. This team’s research was supported in part by the International Research Internship Program of the Korea Research Foundation, a Korea Research Foundation Grant, a Robert A. Welch Foundation grant and funds from the LINTEC Corporation—a firm that collaborates with UT Dallas’ NanoTech Institute on supercapacitor research. SO WHAT? what is the energy density? The article doesn't explain much but my guess is that their buckypaper is extremely thin and strong compared to Al foil or whatever is used in other capacitors allowing for a capacitor with plates of substantially greater surface area / unit volume. Now they need a superdielectric. I read in the national enquirer that bucky got his powers from aliens. I think a site called "physorg" should have a minimum requirement that articles at least say something important and not leave out critical details. Hey TheeJoshMan - Is it necessary to use this website to promote anonweb with every post? It's almost as annoying as Neil Farbstein. Imagine this, imagine that... details or GTFO! TJ_alberta - yes, most wellmade capacitors should last a long time, however dielectrics can degrade. This article essentially reports a new (I'm guessing: high surface area) material from which to make the conductors. While this is important, its far from a complete supercapictor. I'm interested in what dielectric they choose, particularly since it will have to withstand huge charge. Supercapacitors are simple in that their usefulness can be analyzed with the smallest amount of math. People like math but, only a little math. It is certainly true that supercaps have low voltage ratings and it's easy to show why. Capacitance can be increased by massively increasing area (bucky-paper), increasing dielectric constant, and/or reducing separation distance. The dielectric and separation are what determines working voltage. Dry air breaks down around 3MV/m and typical dielectrics have a dielectric constant around 2-3. (Yes I know there are much higher ones with their own drawbacks as well) Let us then assume that the breakdown for a dielectric is roughly 10 Million Volts per meter (1E7). The scale bar on this SEM shows 300nm. If the separation is higher at 1um, then the voltage possible is (1E7 V/m)*(1E-6m) or 1 Volt. Not that high obviously. Capacitance could be increased further at the expense of working voltage until the plate separation is less than 6nm at which time the electrons will just tunnel through. It is really tough to beat the energy in an electrochemical cell with a capacitor though I encourage every option to eliminate batteries and improve energy density. Step back, take a deep breath, and think about the articles logically instead of emotionally. We all want cheap, lightweight energy storage but wishing and cheering wont help. We've got to understand the problems and the drawbacks with solutions. Besides, we could really use some real references and data in these articles. I don't want to have to chase down every journal article by hand. P.S. 1E7 * 1E-6 equals 10, not 1. Hyperspaced, thanks for catching my math mistake. Tried to type up a quick answer and end up making my own errors. Your formula for capacitance simply expands epsilon into the vacuum permittivity and the relative permittivity of the dielectric. Clear to anyone reasonably skilled in the art, as they say. The charge storage equation doesn't help solve for maximum voltage in the capacitor. You are confusing dielectric constant or permittivity with dielectric strength. The dielectric constant of air is 1.0006*epsilon_0 F/m but its dielectric strength is 3x10^6 V/m. They are entirely different properties. The maximum voltage in a parallel plate capacitor is limited by the dielectric breakdown field in volts/meter. When the dielectric breakdown strength is exceeded (10V/um in my example, as you corrected me), the dielectric will arc and ruin the capacitor. I was simply trying to explain maximum capacitor voltage in terms of known material parameters. The same equations are valuable even when it's not parallel 'plates' but an electrolyte solution. Whenever the field exceeds the dielectric's ability to 'stop' it, the charge will not be confined and ruin the cap.